GO! 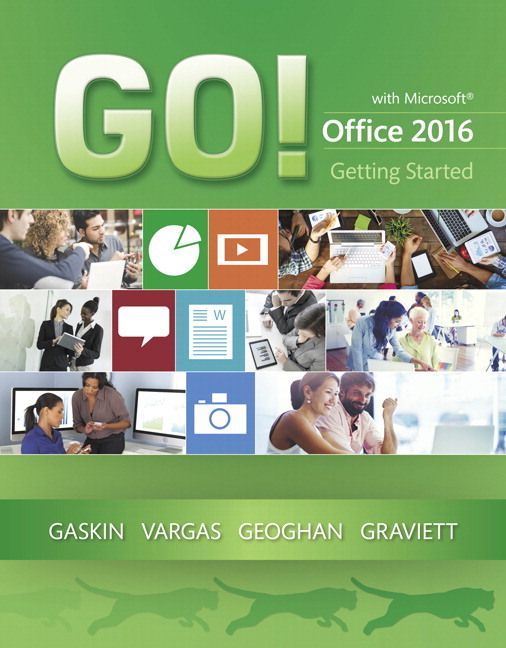 with Office 2016 Getting Started is an Introductory text that offers a chapter on core Office 2016 features, and then one chapter for each of the four primary applications that introduces students to the basic features of each. Using the scenario-based instructional projects students learn the basics and then apply them through mastery, problem-solving, and critical thinking projects. In today's fast-moving, mobile environment, the GO! with Office 2016 series focuses on the job skills needed to succeed in the workforce. With job-related projects that put Microsoft Office® into context, students learn the how and why at the moment they need to know, all in the appropriate Microsoft procedural syntax. For Office 2016, the hallmark guided-practice to skill-mastery pathway is better than ever. Students have many opportunities to work live in Microsoft office to apply the skills they've learned. In addition, these learning objectives are presented in project-based scenarios that prompt students to prove mastery in the context of real-world application. MyITLab for this text provides students and instructors with access to the eText, chapter quizzes, testbanks, and other instructor resources. NEW! 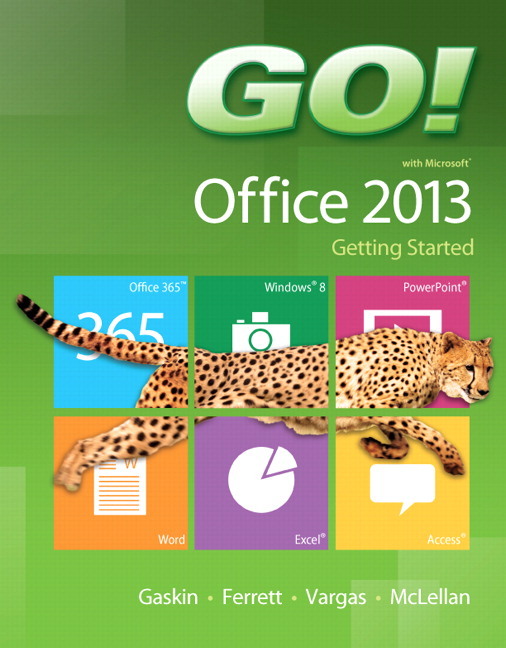 Coverage of Office 2016 features ensures that students are learning the skills they need to work in today’s job market. A project-based approach clusters learning objectives around the projects, rather than software features. The instruction is based on the teachable moment where students learn important concepts at the exact moment they are practicing the skills. Explanations and concepts are woven into each step without making students read long paragraphs of text before interacting with the software. Learning outcomes are clearly stated, with numbered objectives, so students always know what they need to learn. The clean design includes plenty of screenshots that validate students’ actions and engage visual learners. Color-coded steps guide students through the projects with colors coded by project. End-of-project icons let students know when they have completed a project, especially useful in self-paced or online classes. NEW! In-text boxed content is included in-line with the instruction—not in the margins—so students won’t miss this important information and will learn it in context with what is on their screen. This applies to Another Way, Notes, More Knowledge, Alerts, and By Touch. Teach the Course You Want in Less Time: the GO! series’ one-of-a-kind instructional system provides you with everything you need to prepare for class, teach the material, and assess your students. Student Assignment Tracker lets students to track their own work. PowerPoint Presentations provide a visual walk-through of every chapter with suggested lecture notes included. Audio PowerPoint Presentations provide a visual walk-through of the chapter with the lecture notes read out loud. Every assignment is accompanied by either a scoring checklist, a task-specific rubric, or an analytic rubric. Solution Files are provided in three formats: native file, PDF, and annotated PDF. Rubrics provide guidelines for grading open-ended projects. Testbank questions are available for you to create your own objective-based quizzes for review. NEW! IT Innovation Station lets you stay current with Office and Windows updates, news, and trends, especially now that Microsoft Office is in the cloud. Monthly updates on the MyITLab Community site, www.myitlabcommunity.com, from Pearson’s product team and author-instructors will offer tips on understanding updates, using new capabilities, implementing new instructional techniques, and optimizing your Office usage. GO! To Work Page offers a summary of the chapter items focused on employability, including a MOS Objective summary, Build Your ePortfolio guidelines, and the GO! For Job Success soft skills videos and discussions. Nancy Graviett is a professor in the Business and Computer Science department at St. Charles Community College in Cottleville, Missouri, where she is the program coordinator for the Business Administrative Systems program and teaches within the program. Nancy is also very active with distance learning and teaches in face-to-face, hybrid, and online formats. She holds a master’s degree from University of Missouri. Nancy holds Microsoft® Certified Application Specialist certification in multiple applications and provides training both on and off campus. In her free time, Nancy enjoys quilting and spending time with family and friends. Debra Geoghan is currently an associate professor of computer and information science at Bucks County Community College, teaching computer classes ranging from basic computer literacy to cybercrime, computer forensics, and networking. She has earned certifications from Microsoft, CompTIA, Apple, and others. Deb has taught at the college level since 1996 and also spent 11 years in the high school classroom. She holds a B.S. in Secondary Science Education from Temple University and an M.A. in Computer Science Education from Arcadia University. Throughout her teaching career, Deb has worked with other educators to integrate technology across the curriculum. At BCCC, she serves on many technology committees, presents technology workshops for BCCC faculty, and runs a summer workshop for K-12 teachers interested in using technology in their classrooms. Deb is an avid user of technology which has earned her the nickname “gadget lady”.